Unless you’ve been living under a rock, you’ve heard the hullabaloo about Tiger Mom Amy Chua. And just in case you have been living under a rock, no, she’s not an octomom type who has given birth to tiger cubs. She’s a Chinese mother who wrote the best-selling memoir Battle Hymn of the Tiger Mother, which details her journey as a mother of two girls. I haven’t read the book, but as it has caused an uproar the world over, I must say I’m quite interested in picking it up. In the book, Chua discusses her strict parenting style. She didn’t allow her daughters to watch TV or play video games, attend sleepovers or be in school plays, according to the Wall Street Journal article that kicked off the controversy. Her daughters also practiced their musical instruments for hours, and Chua found anything less than an A grade unacceptable. While I haven’t read the book, I did see a video of her discussing the “intensity” of people’s reactions to her book. While Chua is herself pretty intense, I didn’t hate her like I expected to. In fact, she speaks sense a lot of the time. Can’t see the video? 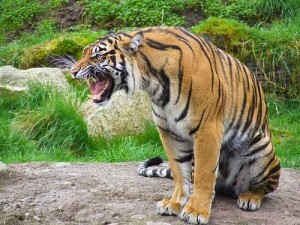 Click here to see the Tiger Mom’s response to the controversy! One statement she made that I particularly loved is “Don’t assume your child is weak.” She makes a great point that if you expect strength and excellence…well, isn’t strength and excellence more likely? I also love that she said that “People get to great places so many different ways,” which is right in line with our own philosophies here. Chua’s youngest daughter even rebelled against her mom, proving that no parenting style is perfect or right all of the time. So while Chua’s strictness may not be my (or a lot of people’s) cup of tea, she does what works for her and her family, and really, who are we to judge?